In John chapter 6 Jesus reminds his questioners that it wasn’t Moses who provided manna in the wilderness. It was God – the same God “who gives you the true bread from heaven. For the bread of God is that which comes down from heaven and gives life to the world” (John 6:32-33). 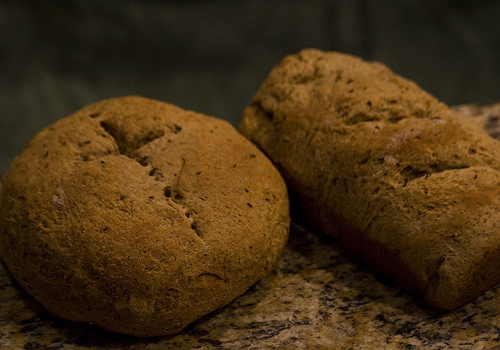 The manna only met the Israelites’ immediate needs for sustenance, not their ultimate human needs. The bread of God is different. It is the gift of life, the pouring out of Jesus’ life for the sake of the world. Jesus has been living bread in my life! I see illumined in Jesus a life filled to the utmost with the presence of God! People were healed with a touch. People were forgiven with a word. People were given new life through a holy conversation. I have always felt that Jesus is a friend who is so close to God that he has brought me closer just by hanging out with him! So when Jesus says, “The bread that I will give for the life of the world is my flesh” (6:51c), there are several meanings. First of all, it recalls the opening chapter of John, where we hear “and the Word became flesh and lived among us” (1:14). These are the words we usually ponder at Christmastime as we consider the incarnation, the gift of Jesus’ life that is born from God’s love for the world. Likewise, we see an allusion in John’s words to Jesus’ death. Jesus will give up his life, his flesh, as an expression of the same love revealed in the incarnation. He offered himself to God in death, thus releasing his life for the life of the world. Finally, we hear a clear eucharistic note in John’s words. Jesus mentions his flesh and his blood as gifts of true food and true drink (6:55). We are invited to have a sacramental meal with our Risen Lord, and to witness to the life that is ours through Christ. Craig Barnes says this about our role as witnesses to the life we have in Christ: “When Christians take on the vocation of being witnesses, it has a dramatic effect on how they conduct their lives. They stop trying to achieve a life and choose instead to receive one. As long as their goal (is) achievement, their constant companion (is) complaint because they (can) never achieve enough. But the day they (decide) to start witnessing the many ways God is still creating their lives, their companion (becomes) gratitude. Even when their lives take a hard turn, there is still opportunity for quiet moments of thankfulness, because by now they have learned how to find the manna and the gentle stream that flows into every desert” [M. Craig Barnes, The Pastor as Minor Poet (Grand Rapids, MI: Eerdmans Publishing Co., 2009), p. 64]. How to find the manna – how to find the living bread that comes down from heaven – how to be nourished by the very presence of the living Christ in our midst – these are the desires in every believer’s heart! Still we do sometimes run into problems. We get wrapped up in trying to “achieve a life,” in trying to earn our standing before others or before God, in striving to be “good enough” or “smart enough” or “well off enough” to convince ourselves that we have achieved what we set out to achieve. Protestant Reformer Martin Luther defined sin as “the heart curved in on itself.” Too often we are curved in on ourselves, even us followers of Jesus, focusing mostly on our own needs and wants, our own aches and pains, our own preoccupations, our own temporary achievements. Jesus beckons us on one of the most important journeys we will ever undertake – the long, countercultural journey outside of ourselves toward the true center of our being, the God who creates us and loves us and saves us from ourselves. Jesus invites us on a journey toward wholeness as we risk living and loving for the sake of a calling bigger than ourselves. No more hearts turned in on themselves, but rather hearts turned outward in Christ-like love for the world! Your words are a welcome guide through John Chapter 6, readings we have been hearing these past weeks in church. It’s meaty stuff and slow going, the sort of scripture that you must chew on again and again before you can even begin to understand.